Atlanta, as I predicted, came out flat last week. Chalk one up for the Saints syndrome. Matt Ryan had gone from showing up big time in week one to disappearing behind his 3 picks last week. The Falcons had a hard time getting anything going in the first half with their longest drive being 40 yards and only getting a field goal from it. In the second half they went 3 and out, pick on first play of second drive in the 2nd half, 10 plays/59 yards/pick, 10 plays/77 yards/TD, 5 plays/6 yards/punt, 10 plays/22 yards/pick. The Buccs have kept their 2 losses to less than a TD difference. The problem is they lost by 6 to a Cam Newtonless Panthers and a Rams team without a true starting QB and their best pass rusher, lost by 2 at home. They are facing a fully loaded and ready to redeem themselves Falcons team. Josh McCown has completed at least 62% or more of his passes but has yet to have a 200 yard passing game. His TD/INT ratio is 2/3 so far through 2 weeks. He has yet to stretch the field beyond a 30 yard pass. That creates a lot of pressure in the box but they are 11th in the league with rushing yards. The star emerging is not Doug Martin, it’s Bobby Rainey who ran for 144 yards in last weeks game. Out of their 20 drives this year, only 7 have climbed above 50 yards and ended like this: 4 TD’s (their only TD’s on the season), 2 INT’s and 1 FG. They are 27th in the league averaging 17.5 first downs per game. The leading team are the Saints with 28. Their drives go like this: 11 drives of 21 over 50 yards ending with 2 FG’s, 7 TD’s, Punt, INT. Granted the Saints are 0-2 but have only lost by a field goal or less in those games. The Buccs need to sustain their long drives, eliminate those turnovers and they’ll result in more points and need to gain more first downs per game. The usual number you would like to see is 20 out of the 60-70 plays a team runs. The key for the Buccs may be for them to stray more towards the running and keeping McCown to shorter, more efficient passes to get those needed first downs. The Falcons are back at home where Ryan is 37-10 at home. He still has Roddy White and Julio Jones in the lineup so far which means bad things for the Buccs secondary. Look for the Falcons to win this one and taking the points -6.5 in the Over, the Falcons will put up points in bunches. Falcons 28-20. 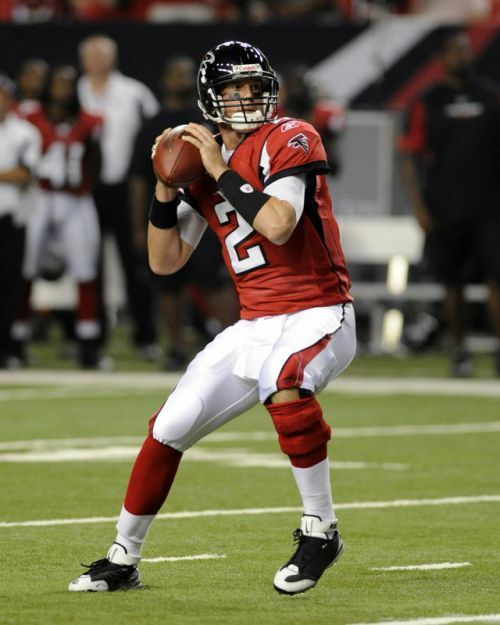 Matt Ryan will tear up the Buccs!